Well, my goosegog situation is getting worse! I noticed that a very small chick (can't keep the blessed things in the orchard as they keep squeezing through the fence) was jumping up at the gooseberry bushes. So I thought, perhaps there are some left at the top of the bushes. Taking my picking basket I set about seeing if there was anything to salvage. Eeeeek! what has happened to the leaves ?! 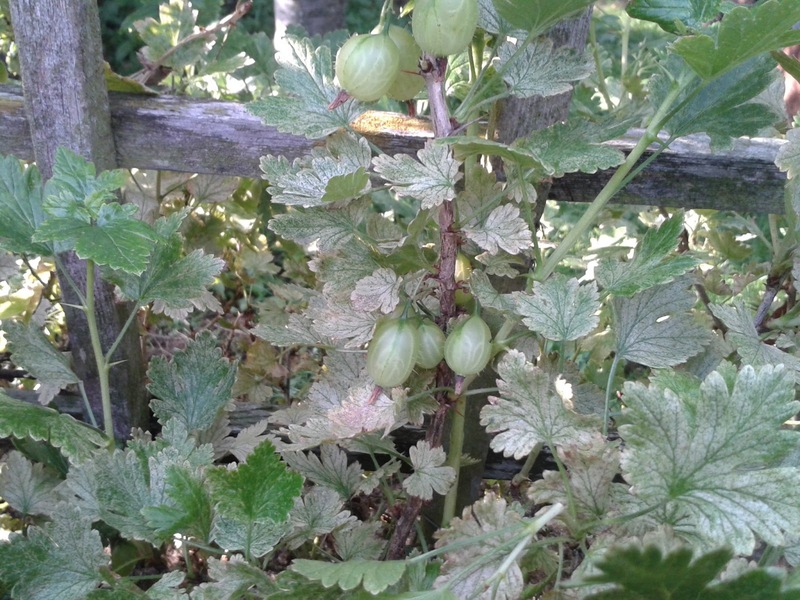 A few years ago I had a lot of problems with Gooseberry Mildew, so I grubbed out the plants and replaced with a variety called "Invicta" which are resistant to this mildew. SO WHAT IS THIS I SEE? It doesn't look like mildew. The leaves are dry and silver...... Any ideas Blogfriends? 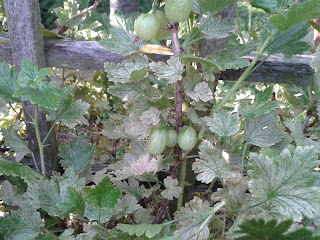 On a more cheerful note I went into the paddock garden to see how the gooseberries are faring there. Hurrah ! They are looking good and some are ready to pick....so I did ! Next, into the orchard to see if any elderflowers are ready, and some were.. so I picked some! 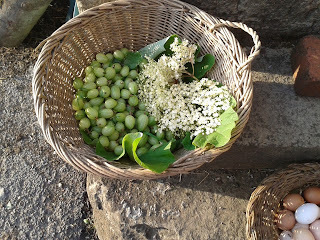 So tomorrow I will make some gooseberry fool with elderflower.. Oh yes, a taste of summer. The weather has been so good today and the jobs going so well that we carried on working well into the evening. When we did stop I felt I couldn't go another step. Then I realised we hadn't eaten since lunch and I had no idea what we were going to eat. So I did a most unusual (for me) and unfrugal thing... I drove to the chippy and bought us fish and chips! There, I admit it. I fell off the Frugal wagon ! I need to correct a mistake from yesterday. I said that YGD gave me the idea for the coathanger book holder, when obviously it was the elder GD. (YGD is only 7) Soz to her!